Unlike some cheaper C-Shell copies, these official C-shells are are of a high quality, close correctly, and look professionally made. Cheaper or economy C-shell copies often do not close properly, do not retain the disc effectively, and just look kind of wonky. 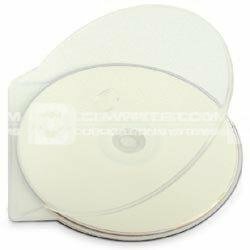 If you are looking to present your disc as a high quality product, ensure you always choose official C-shell cases. These fantastic lightweight, virtually unbreakable, distinctive shell type cases look the business and their simplicity, look and feel are all valuable assetts. Due to their original styling and clear/opaque nature CDs and DVDs that are printed or labelled look fantastic. Picture for illustration only. These Cshells were much better than the other cheaper ones I found on the internet that didnt fit together properly and kept letting the discs drop out. These Cshells are actually the proper trademarked Cshell rather than a cheap copy. Genuine . Clear . C-Shells . - . 100 . pack . C-shell . branded .